All transactions are safe and secure with a reliable history in online purchasing behind each of our associates. 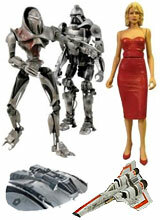 Buy the Battlestar Galactica Action Figures and Toys to own Battlestar Galactica clothing and merchandise. Carry out your own interplanetary battles with the wide selection of Battlestar Galactica action figures and spaceships. The collectible toys allow you to embrace your favorite characters (figuratively speaking) and elements from the TV series, including the Colonial Viper Fighter, Cylon Raider Spaceship, and characters like Number Six, Starbuck, Cylon Centurions and Commander William Adama. In addition to the Battlestar Galactica Action Figures and Toys above, browse the Battlestar Galactica Clothing Gallery for more apparel like men's and women's clothes, kids shirts or hoodies.